Obesity imposes considerably high economic costs on the health-care system. It is proposed that 10% of health-care costs belong to direct and indirect effects of obesity. Taking measures to prevent, manage, and treat obesity is costly. However, some benefits can be obtained by reducing economic costs and by improving health in the future. This study aimed to systematically review the costs caused by obesity. We systematically searched the English language literature indexed in PubMed, Scopus, and Web of Science databases (January 2000 to September 2017). Articles were included if direct and indirect costs of obesity were assessed among participants at the age of more than 18 years. Key terms including economic burden, medical cost, nonmedical cost, and obesity were used for this search. From a total of 20 studies, 9 papers found to be relevant for reviewing. According to these papers, obesity accounts for 31.8% of direct costs (health-care costs related to obesity) and 68.1% of indirect costs (costs related for reducing productivity and production value). Therefore, obese people spend 32% more for medical costs compared to people with normal weight. Due to great number of short-term and long-term complications of obesity and its potential economic impact, efforts are needed to be taken to facilitate health interventions and social policies. Nationally, as obesity imposes high costs on people and health-care system which should fund most of these costs, developing plans to decrease these costs are needed. Prevalence of obesity is increasing in the world dramatically and it becomes a serious health problem in the world. Obesity is both health problem and economic phenomenon. Obesity is considered as a disease in the modern world caused by diet of people and new civilization and industrial life. However, the number of people suffering from obesity or overweight is different in various countries. Kuwait and Bangladesh have the world's highest and lowest percentage of obese people, respectively. Iran ranked 77 in the Forbes ranking in terms of obesity. According to the Forbes magazine's report, approximately 53% of Iranians suffer from overweight, which 43% of them are male and 57% of them are female. In addition, the number of people suffering from obesity or overweight is different from one city to another city, Tehran and Mazandaran Provinces have the highest rate of obesity, while Kerman and Sistan Provinces have the lowest rate of obesity in Iran. The main roots of obesity in the world are immobility and the change in the diet of people. The food consumed by people in the world is richer and its calorie is being increased. As food calorie increases, the need for mobility increases, but mobility is reduced with industrialization growth in communities. In addition, access to food among people has become easier with development of technology and economy. Technological development is also the major cause for reduced mobility. Other major factors that influence obesity are stress, drugs, the environment, and urbanization growth. In general, it could be claimed that new lifestyles lead to obesity. As the prevalence of obesity increases, the prevalence of diseases related to obesity including diabetes type 2, cardiovascular diseases, and different types of cancers (endometrium, postmenopausal breast, kidney, and colon cancer), musculoskeletal disorders, sleep apnea, and diseases related to the gallbladder is also being increased. Based on the World Health Organization statistics, obesity accounts for 60% of the deaths among the Iranian people (21,000 per year) and it is the fifth cause of death in the world. Based on this organization, approximately 2.8 million adults die annually because of obesity or overweight in the world. In addition, 44% of diabetes burden, 23% of cardiovascular disease burden, and 7%–41% of specific cancers burden in the world are related with obesity and overweight. Difficulties related to overweight and obesity are the leading cause of economic costs for people and government as well as health problems. Overweight reduces physical and social activity leading to psychological problems. For this reason, it can be hard for an obese person to get a good job. In this regard, if an individual finds his desired job, his productivity in that job will not be as much as normal people. Accordingly, overweight and obesity cause much costs on health-care system and cause problem for workforce and economy of a country. Based on a report released by the McKinsey Global Institute, obesity imposed cost equivalent to 2 billion dollars to the world economy in 2012. These costs included health-care costs, loss of productivity, and other costs spent for reducing the impacts of this problem, and its value was 2.8% of world's gross domestic product. The prevalence of maternal obesity in world is estimated between 2% and 25%. Obesity has short- and long-term health effects for pregnant women and infant during pregnancy. Thus, health risk factors have been increased and demand for additional cares and to use health service resources are being increased. This systematic review is designed at creating valuable information about the costs of obesity internationally through looking for answers to the following questions: what are the direct, indirect, and total costs related to obesity? Any planning, prevention, and treatment need to estimate the exact statistics on cost of obesity, so assessing these costs will be useful in identifying effective strategies that might be helpful in preventing the obesity. This research was carried out by systematical reviewing of papers that have been published between 2000 and 2017. For this purpose, all papers published in English language since 2000 were derived by researchers by conducting a search in medical databases of MEDLINE, PubMed, ISI, EMBASE, Cochrane, and EconLit commerce database and using a strategy to search papers with keywords obtained from MeSH, including BMI, overweight, obesity, employment, income, direct medical costs, indirect medical costs, and reduced productivity. Their combinations also done by AND and OR search operators. After reviewing the title and abstract of the papers, duplicate and irrelevant studies were eliminated. In the next step, the full text of the papers was reviewed and those papers that met the inclusion criteria were included to be reviewed. Studies were included if (1) referring to direct costs of obesity, (2) referring to indirect costs of obesity, and (3) studies carried out since 2000 onward. It is important to note that the minimum inclusion criteria were used to increase the sensitivity in selection of papers. However, to achieve the most relevant and high-quality studies, exclusion criteria were selected as follows: (1) unrelated studies based on the study design and research subject (any study with subject of obesity but without investigating the economic effects), (2) studies that did not provide adequate information (lack of reports of obesity costs), and (3) low quality of studies based on scores obtained from the checklist. This checklist included 12 sections covering various sections of a report. Score 1 was given for each section, but higher scores were given for some other sections that were more important [Table 1]. The minimum score was 12, and the maximum score was 15 in this checklist. Ultimately, the papers that obtained the minimum score (Score 12) were included in the study and they were reviewed. According to what was explained in the first step, 20 papers were obtained in systematic search of database, which 9 papers among them were selected after eliminating the abstract section of papers and repeated papers related to our desired criteria [Figure 1]. The main information was obtained from selected studies and summarized in [Table 1] that considers the following data: country, type of study, estimation method, and amount of direct and indirect costs. Then, the studies were compared using the above information. Reviewing the 9 papers in this study revealed that the lowest and the highest direct costs (the cost spent merely on medical care by those who have obesity) and indirect costs of obesity (reduced economic productivity of obese people or their premature death because of obesity complications) were related to a study conducted in China with 12% and 88%, respectively, while the highest and lowest direct and indirect costs were found 49% and 51%, respectively, in a study conducted in Germany. 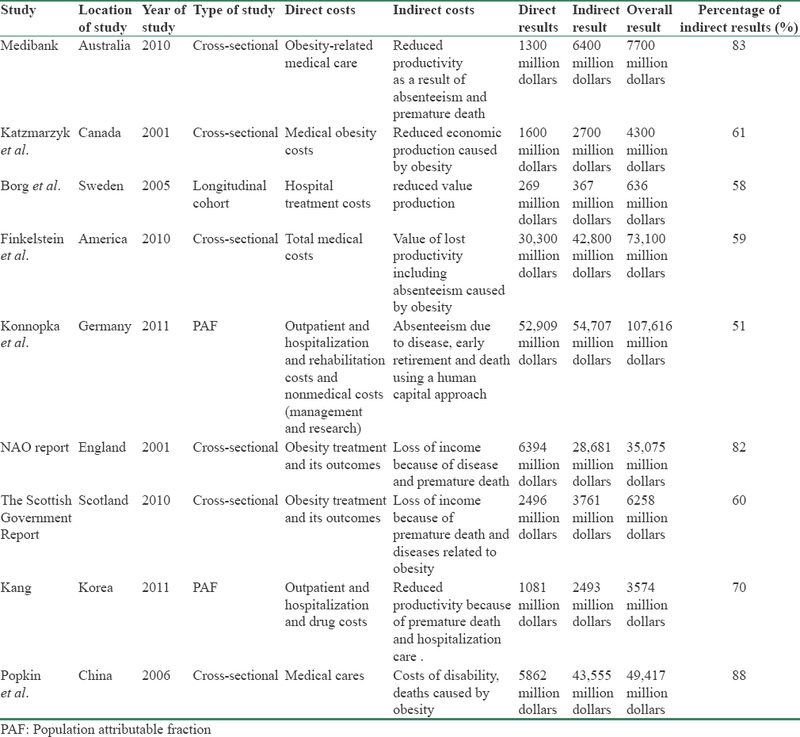 [Table 2] provides the characteristics of the papers reviewed on the costs of obesity during 1 year around the world. In general, in 9 studies met the inclusion criteria and published between 2017 and 2000, direct obesity costs were 31.8%, while indirect costs of obesity were 68.1% annually. 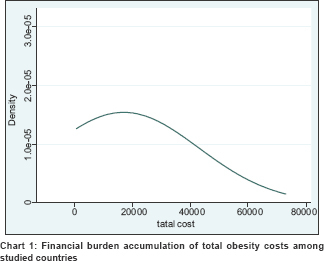 The financial burden accumulation of total obesity costs among studied countries is presented in [Chart 1]. Total cost of obesity in these countries is illustrated in the horizontal axis, and the density of countries in terms of the mentioned indicator is illustrated in the vertical axis. The density point of total cost of obesity is about 18000 dollars. As seen in [Chart 2], the density point of indirect cost of obesity is about 11000 dollars. 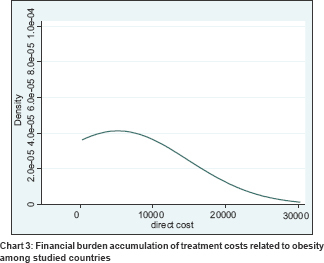 The density point or accumulation of treatment costs related to obesity, as shown in [Chart 3], is approximately 8000 dollars in the countries studied. 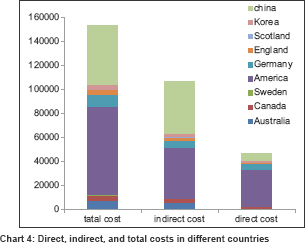 [Chart 4] illustrates the total cost of obesity (direct and indirect costs) in different countries. While studies have been carried out at different times with volumes of samples, this chart illustrates the perspective and an important picture of the treatment and economic effects of obesity on the studied countries. As illustrated in this chart, the highest cost of obesity belongs to the United States and China and the lowest cost of obesity belongs to countries of Scotland and Sweden. The present study was carried out to assess the economic burden of obesity around the world. To the best of our knowledge, no systematic review has been carried out so far to examine both direct costs and indirect costs. Comparison of medical costs of obesity among obese and overweight people reveals that obese people spend annually medical costs 32% more compared to those who have normal weight. A review study carried out by Katzmarzyk and Janssen in Canada in 2001 revealed that annual direct and indirect costs of obesity are 39% and 61%, respectively. The annual direct and indirect costs of obesity in the Scottish Government in 2010 were reported to be 40% and 60%, respectively, per year in 2010. In a review study conducted by Borg et al. in Sweden in 2005, direct and indirect costs of obesity were reported to be 42% and 58%, respectively. In a study conducted by Finkelstein et al. in 2010, they reported that annual direct and indirect costs of obesity in the US are 41% and 59%, respectively. In addition, in a review study performed by Konnopka et al. in 2011, the annual direct and indirect costs of obesity were reported to be 49% and 51%, respectively. In a study conducted by Popkin et al. in China in 2006, they reported annual direct and indirect obesity costs 12% and 88%, respectively. According to the study conducted by Medibank in Australia in 2010, he reported the annual direct and indirect costs of obesity 17% and 83%, respectively. According to the National Audit Office report in England in 2010, the annual direct and indirect costs of obesity were reported 18% and 88%, respectively. In the study conducted by Kang in Korea in 2011, the annual direct and indirect costs of obesity were reported 30% and 70%, respectively. In this regard, policy-makers used high annual cost of obesity as justification for intervention of government. The lowest direct cost of obesity was related to Popkin's study with 12%, while the highest direct cost of obesity related to Konnopka's study with 42%. According to the Forbes magazine, approximately 53% of Iranian people are overweight, and it ranked 41 among these countries with having 14.2% of the obese population. Thus, health-care planners should pay more attention for prevention and treatment of this metabolic disorder. Otherwise, the obesity prevalence will raise and it will lead to great economic crises. Considering the changes in lifestyle of people and the changes in the environment of people occurred during the 30 years, it is increasingly difficult for people to maintain the healthy weight. If this trend continues, the prevalence of obesity will increase certainly. To maintain healthy weight in recent decades was not so difficult for most people, while it is very difficult for people to maintain their healthy weight nowadays. Even with having full knowledge on advantages of the physical activity, the nutritional value of foods, and the health effects of obesity, a part of the population will be involved in lifestyle naturally, leading to weight gain. As major parts of costs imposed by obesity are funded by taxpayers, decisions made on physical activity and food consumption of these people are not considered natural from a broad social perspective. It suggests that the role of government in reducing obesity should be considered. Many people believe that information-based interventions or other interventions that do not influence the costs or benefits of decisions on physical activity and food consumption might not be so effective. According to some people, additional stimuli might be required in order to encourage them to lose weight. Government plays vital role in developing strategies to prevent obesity, and it is obliged to execute strategies (diet, physical activity, and health) to combat obesity. However, findings of studies reveal that interventions should be multifaceted in order to have greater chances to be successful. In other words, coordinated efforts of people, staff, and the government will be required to reduce the rate of obesity and costs related to obesity in the future, according to the current trends. This systematic review suffers from some limitations that they should be considered. Lack of access to all papers and reports can be considered as the most important limitation of this study. In addition, the descriptive nature of this systematic review makes it difficult to understand and interpret the causal relationships, while it will be useful to develop hypothesis for next studies. In this systematic review, we concluded that increased obesity increases medical and nonmedical costs of obesity. Thus, the prevalence of obesity in the community can be reduced by providing educational programs and considering the culture of people in each region. Kopelman PG, Caterson ID, Dietz WH. Clinical obesity in adults and children. 3rd ed. Oxford: John Wiley & Sons; 2009. Propper C. Why economics is good for your health 2004 royal economic society public lecture. Health Econ 2005;14:987-97. Ahmad KA, Najafi B. Obesity in type 2 diabetes: A review of health economics evidences. Hakim Res J 2012;14:233-41. Abdollahi AA, Vagari G. The correlation between age, gender and education with obesity in urban population of Golestan province. Iran J Endocrinol Metab 2010;12:276-82. Norhidayah A, Kamaruzaman J, Syukriah A, Najah M, Azni Syafena Andin S. The factors influencing students' performance at Universiti Teknologi MARA Kedah, Malaysia. Manage Sci Eng 2009;3:81. Haidar YM, Cosman BC. Obesity epidemiology. Clin Colon Rectal Surg 2011;24:205-10. Hawkes C, Smith TG, Jewell J, Wardle J, Hammond RA, Friel S, et al. Smart food policies for obesity prevention. Lancet 2015;385:2410-21. Wyatt SB, Winters KP, Dubbert PM. Overweight and obesity: Prevalence, consequences, and causes of a growing public health problem. Am J Med Sci 2006;331:166-74. Trasande L, Chatterjee S. The impact of obesity on health service utilization and costs in childhood. Obesity (Silver Spring) 2009;17:1749-54. World Health Organization. World Health Statistics. Geneva: World Health Organization; 2012. Incavo SJ, Derasari AM. The cost of obesity: Commentary on an article by Hilal Maradit Kremers, MD, MSc, et al. “The effect of obesity on direct medical costs in total knee arthroplasty”. J Bone Joint Surg Am 2014;96:e79. Simmons JK, Amlin-Van Schaick JC, Geiger TR, Reilly K, Hunter K, Mock BA, et al. Mouse genetics 2011: Meeting report. Mamm Genome 2012;23:225-31. Rowlands I, Graves N, de Jersey S, McIntyre HD, Callaway L. Obesity in pregnancy: Outcomes and economics. Semin Fetal Neonatal Med 2010;15:94-9. Von Elm E, Altman DG, Egger M, Pocock SJ, Gøtzsche PC, Vandenbroucke JP, et al. 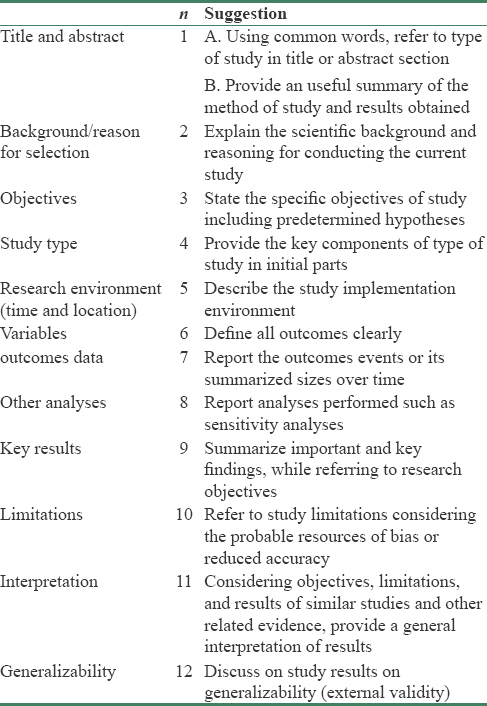 The strengthening the reporting of observational studies in epidemiology (STROBE) Statement: Guidelines for reporting observational studies. Int J Surg 2014;12:1495-9. Katzmarzyk PT, Janssen I. The economic costs associated with physical inactivity and obesity in Canada: An update. Can J Appl Physiol 2004;29:90-115. The Scottish Government. Preventing Overweight and Obesity in Scotland: A Route Map Towards Healthy Weight. Edinburgh: The Scottish Government; 2010. Borg S, Persson U, Odegaard K, Berglund G, Nilsson JA, Nilsson PM, et al. 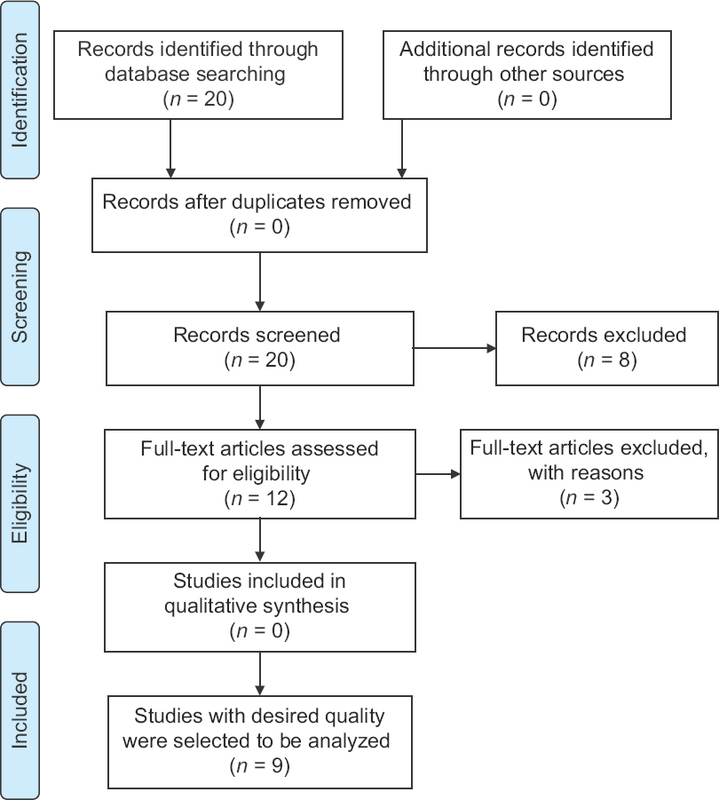 Obesity, survival, and hospital costs-findings from a screening project in Sweden. Value Health 2005;8:562-71. Finkelstein EA, Ruhm CJ, Kosa KM. Economic causes and consequences of obesity. Annu Rev Public Health 2005;26:239-57. Konnopka A, Bödemann M, König HH. Health burden and costs of obesity and overweight in Germany. Eur J Health Econ 2011;12:345-52. Popkin BM, Kim S, Rusev ER, Du S, Zizza C. Measuring the full economic costs of diet, physical activity and obesity-related chronic diseases. Obes Rev 2006;7:271-93. Medibank. 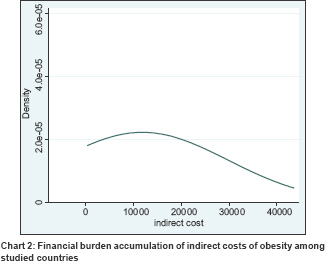 Obesity in Australia: Financial Impacts and Cost Benefits of Intervention. Health Services Australia Pty., Ltd., Medibank Health Solutions; 2010. National Audit Office. Tackling Obesity in England. The Stationery Office; 2001. Kang JH, Jeong BG, Cho YG, Song HR, Kim KA. Socioeconomic costs of overweight and obesity in Korean adults. J Korean Med Sci 2011;26:1533-40.